Markets are constantly moving. Viafield Market Flex is for the customer who wants to be in control and express their market bias. Market Flex allows you to sell your grain and stay exposed to the futures market. You establish an initial Market Flex price on a selected futures month and then re-price at a later date, allowing you to stay in the market to participate in potential market appreciation. The resulting gain or loss from that initial price then becomes a part of your final contract price. Market Flex should be used when you feel that futures prices have upside potential in relationship to the current market. It can be used at delivery or when you need to transfer ownership of grain due to space limitations, grain condition or financial need. Utilize the contract when you are confident that futures prices in the selected month will improve and you are comfortable without an absolute price floor. What are the advantages of the Market Flex contract? Lock in a futures level on a priced cash contract, knowing that if market conditions change you can participate in a potential futures price movement. Cash can be generated in the form of an advance on delivered production; advance levels may vary by location. Offers an alternative to paying Price Later Contract (PLC) charges or storage charges. Flexibility of having the opportunity to improve the futures level for up to 8 months after already making a selling decision. Possibility of an increase in the contract price from the initial Market Flex price. Relatively straightforward and easy to understand compared to using more traditional brokerage services that require margining. Use of downside protection is suggested, which can be in the form of a fixed price stop, trailing stop, or strategy using a long put. 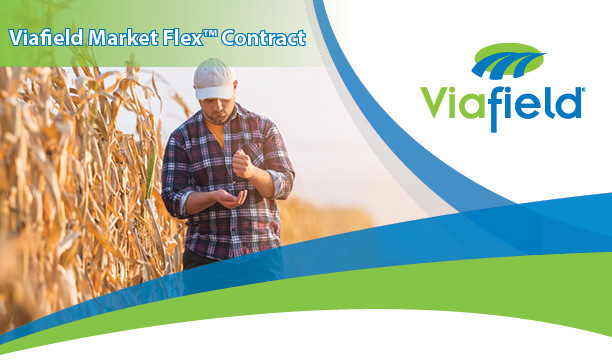 Example: On October 10th you decide to sell your corn for $3.00 per bushel (cash price) for October delivery, but are very interested in using Viafield Market Flex. You are confident that the July futures will improve relative to current Levels. July futures are currently at $3.80 per bushel. You instruct Viafield to establish your initial Market Flex price. On May 15th, July corn futures have risen to $4.20 per bushel. You instruct Viafield to re-price and lock in your final Market Flex price. In this example, using Market Flex would net you 36 cents more for your cash sale. On May 15th, July corn futures have fallen to $3.60 per bushel. You instruct Viafield to re-price and lock in your final Market Flex price. In this example, using Market Flex would net you 24 cents less for your cash sale.